Britain's most famous and arguably finest timber-framed moated manor house. The drunkenly reeling south front, topped by spectacular long gallery, opens onto a cobbled courtyard and the main body of the Hall. Magnificent wall paintings and a notable knot garden are of special interest. The Hall has served as a location for several films including Lady Jane and Moll Flanders. The Hall is 4 miles south of Congleton on the east side of the A34 (MR 118 : SR832589). The property is owned by the National Trust - telephone 01260 272018 for further details. One of Britain's most exciting and unusual gardens. A series of 'compartments' designed in the mid 19th century by James Bateman to display specimens from his extensive and wide-ranging plant collection. The garden is a miniature tour of the world with the Egyptian Court, an imitation of the Great Wall of China, a pinetum, fernery and rock gardens. The gardens are 3.5 miles SE of Congleton, 7 miles N of Stoke-on-Trent. Access is from the A527. The property is owned by the National Trust - telephone 01782-517999 for further details. 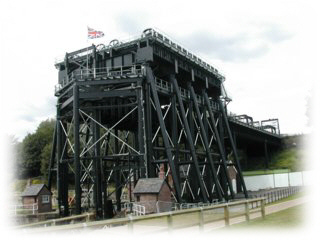 The Anderton Boat Lift is located near Northwich and is one of the greatest monuments to the British canal age. It was designed and built in 1875 to speed up the transfer of cargoes between the Trent & Mersey Canal and the River Weaver. It ceased operation in 1983 following a safety inspection. With the help of the Heritage Lottery Fund towards the £7million restoration cost the lift was re-opened in March 2002. Further details are at The Anderton Boat Lift or British Waterways web sites.